Cutting precisely and smoothly in all directions, a sliding compound mitre saw will prove to be a valuable addition to any professional toolbox. 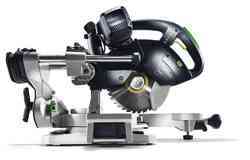 Within our range of high performance sliding compound mitre saws, you’ll find the Sliding Compound Mitre Saw KAPEX KS 60, the Sliding Compound Mitre Saw KAPEX KS 88, and the Sliding Compound Mitre Saw KAPEX KS 120. The saws in our collection offer a variety of impressive features, including ergonomically positioned carrying handles, cable holders, transport safety devices, and more. 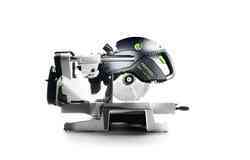 Thanks to the error-free transfer of the angle with the bevel and LED spotlights for enhanced visibility of the scribe mark, a sliding compound mitre saw will also help to minimise waste and material costs. For further functionality and reliability, we offer a range of accessories and consumable materials to complement your sliding compound mitre saw. From universal saw blades, fine tooth saw blades, special saw blades, and trimming attachments, we’ve got everything you need to ensure you get the most out of your saw, whatever you’re working on. Of course, if you require any further information about our sliding compound mitre saws, or any of our other high quality, performance focused power tools, please do not hesitate to get in touch. Our experienced and knowledgeable team is always on hand to answer any of your questions to ensure that you find the right tools for your requirements.